General Motors will unveil a new driverless concept car as early as Friday that doesn’t have a steering wheel or pedals, the latest salvo in the company’s efforts to deploy autonomous vehicles onto public roads. The debut was confirmed by sources familiar with the matter and documents seen by Jalopnik. As part of the announcement, sources said, GM and its autonomous car unit, Cruise Automation, will submit a report to the National Highway Traffic Safety Administration on how it plans to safely equip cars with self-driving technology and deploy them on the road. To date, Google’s self-driving car unit Waymo is the only company to submit such a report to NHTSA. It’s not clear if GM’s showing off a working prototype or just a concept. If the automaker tries to deploy the car for testing purposes, it’d be one of the most futuristic vehicles on the road to date. Google’s self-driving car unit Waymo launched a pilot program late last year that involves cars without a driver at the steering wheel. A GM spokesperson declined to comment unless Jalopnik agreed to an embargo for an unspecified announcement at an unspecified time. Later, when asked directly about whether the automaker’s planning to show off a car without a steering wheel or pedals, GM spokesperson Ray Wert told Jalopnik he had no comment. NHTSA didn’t immediately respond to a request for comment. GM rolled out an extensive game plan in November for the company’s autonomous driving plans. The automaker said it’s confident it can deploy fully autonomous cars in 2019 that could be used for a ride-sharing service. It’s an aggressive timeline for an automaker that only recently started offering public rides to show off its autonomous technology. In California, Cruise reported the most accidents in 2017 involving an autonomous vehicle among the dozens of companies permitted to test self-driving cars in the state. Cruise reported 22 of 27 total reported accidents last year, while Waymo recorded three accidents. The reports pin blame on human error, but they illustrate the challenges ahead for companies trying to developing autonomous car technology. 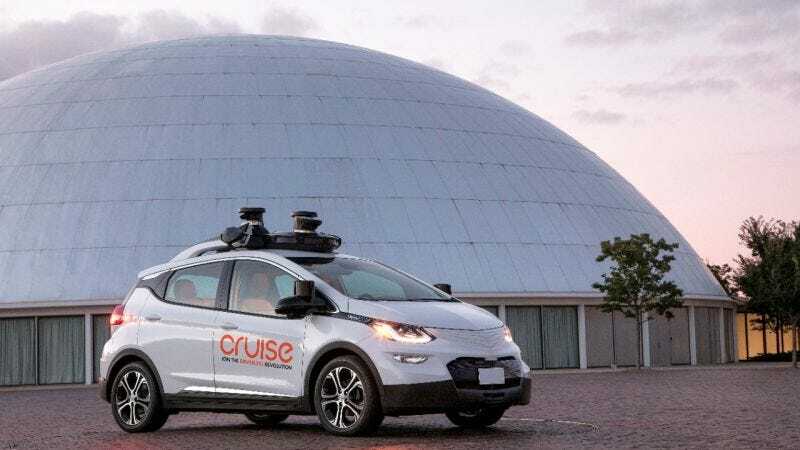 Cruise’s CEO said in November that its plans for self-driving deployment won’t include small-scale pilots “where you’ve got drivers still in the car,” a fact that immediately raised concern from safety groups. Cruise launched a pilot app in August that allows employees in San Francisco to take test rides in the company’s autonomous cars for free. But GM has a significant investment in ride-hailing company Lyft and also maintains a ride-sharing platform of its own, Maven. GM and Cruise are currently building autonomous Chevrolet Bolts at an assembly plant in Michigan. The company has built 180 self-driving Bolts so far, and by early 2018, it expects its autonomous fleet to accumulate 1 million miles per month during test drives.